Austin Peay will be paired with Gardner-Webb and Old Dominion during Sunday’s opening round, with Alabama State, Bradley, Campbell, Delaware, Florida Gulf Coast, Presbyterian, South Dakota, Stephen F. Austin, Valparaiso and Ohio Valley Conference foes Jacksonville State and Tennessee Tech set to round out the field. Caledonia GC is a par-71, 5,904-yard track nestled some 30 miles south of Myrtle Beach. This will be the third official visit the Govs have made to Pawley’s Island, playing the tournament in 2012 and 2015; Austin Peay was supposed to participate in last year’s event before Hurricane Irma forced its cancellation. A pair of freshmen will bookend Austin Peay’s lineup to open the season. After a tremendous week of qualifying, Taylor Dedmen will play as the No. 1 in her first career collegiate event, while Shelby Darnell grabbed the fifth spot for her debut. Now seniors, both Goodley sisters remain lineup staples. Taylor Goodley will play as the No. 2 this week, while 2018 All-OVC choice Ashton Goodley will start out as the No. 4. Since their arrival at Austin Peay, at least one of the twins have earned All-OVC honors each season and look to make it 4-for-4 in 2018-19. Sophomore Riley Cooper, who enjoyed a solid qualifying effort, will play as the No. 3 for the Govs at Pawley’s Island. 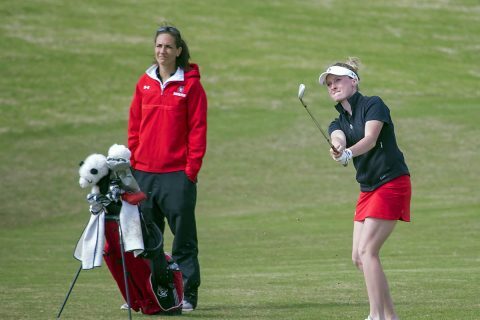 The Clarksville native competed in eight of 12 tournaments in her first season as a Governor. Head coach Amy McCollum, who shed the interim tag over the summer after sharing 2018 OVC Coach of the Year honors, is excited to begin her first full season at the helm of the program. Live scoring for this event will be provided courtesy of GolfStat.com. A complete recap will be available at the end of each round via LetsGoPeay.com and live updates can be found on Twitter (@AustinPeayWGO).